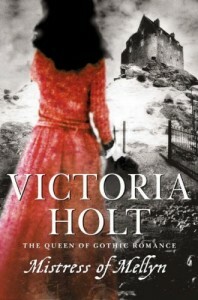 I wasn’t at all sure that Victoria Holt was my sort of author, but I had to give a gothic romance set in Cornwall the benefit of the doubt. And when I read the opening words I was so glad that I did. As the train carried me through the wooded hills and past green meadows, I was taken this second course; partly, I suppose, because I had never had an opportunity of trying the former. Martha Leigh – known to her family and friends as Marty – was travelling on the same journey that I have made many times in real life and a few times in print too. She was travelling through Somerset, through Devon, and across Mr Brunel’s bridge into the Duchy of Cornwall. I liked her. She was sensible, she was bright, she was curious and she was understanding; in just the right proportions. And she was to be a governess, to the young daughter of a wealthy widower. I thought that the position might suit her rather well, and indeed it did. Marty could understand Alvaen. She could build a relationship with her. She could lay plans to help her win the approval of her father that she so desperately craved. But she couldn’t understand Alvaen’s parents. Fortunately Victoria Holt had the ability to take those familiar ingredients and create something a little different. A well executed work of gothic suspense, where as soon as one question is answered another one appears, as soon as one crisis is averted another has to be faced, until one final drama resolves everything. And I could understand them. The governess who was happy in her role, but who struggled with her position in between the family and the household staff. The unhappy child who blossomed when she was shown real care. And all of the others; every character rang true. There were some lovely touches, in the dialogue, in the descriptions, in well chosen details, and everything was held together by good old-fashioned storytelling. I can see similarities between Victoria Holt and Mary Stewart; they were near contemporaries but Victoria Holt’s settings are earlier and she seems rather more gothic; from the start though, I thought that her heroine could have fitted into a Mary Stewart novel quite beautifully. Sadly there were some weak spots. When the romance came to the fore it didn’t seem as natural as it had when it was mixed was the suspense. The ending seemed a little rushed, and I would have prefered a fuller conclusion in the final chapter to the epilogue that was offered instead. None of that stopped me from loving Mistress of Mellyn, but it did remind me that the books that inspired it were far finer. So I’d like to read them again before long, and I’ll give any of Victoria Holt’s other novels that cross my path a fair chance too. Oh, perfect! … I need something gothic for the annual R.I.P. challenge, and a gothic romance would be my cup of tea! Audrey. if that’s what you’re looking for this would be perfect. I spent my teens reading Victoria Holt mysteries … loved them! I remember this title if not the content. Nice review. I have liked the Holt books and I think I’ve read quite a few of them before I got my hands on the other historical fiction/romance novels. She does what she does very well. Are there any others you would particularly recommend. In my twenties, (further back than I care to think about) I was addicted to Victoria Holt’s books, I thought she was the bee’s knees. I really haven’t read anything by her since then but your excellent review makes me wonder if I should revisit. It’s certainly worth a try Cath, if you do go back you’ll appreciate that she does Cornwall very well. I expect you already know, but Victoria Hold also wrote under several other names, including Jean Plaidy and Philippa Carr. I think she had about six pseudonyms. I loved her gothic romances (Kirkland Revels springs to mind) which I read in the 1960s/1970s. If you like her, you might also enjoy the historical romances of Catherine Gaskin. Start with Blake’s Reach, which is set on the Romney Marsh in East Sussex. I knew those two pseudonyms, and I have a feeling there may be one or two more. Different names for different styles/genres it seems. And thank you for reminding me of Catherine Gaskin – I used to love her books but she’d slipped from my memory. Hopefully the library still has a few of her books tucked away. I’ve been pondering whether to read Victoria Holt or not – she is so often compared to Mary Stewart, whom I love, that I was curious to see if she would be as enjoyable to read. I’m glad you tried her out and that she passed your test. Now I feel I can read her with pleasure. Thank you! I hope she lives up to expectations. I don’t think you will love her in quite the same way as Mary Stewart, but on the evidence of this book I would have to say that she does gothic romance very well. one of my favorite novels and authors, nice review. I spent many a teenage hour reading Victoria Holt, Fleur. I haven’t read a book by her for years and I’m not sure she’d be my cup of tea any longer. But I did enjoy her. In rely to the comment above, I didn’t read Mary Stewart as a teenager but I have read her recently. The two are very similar so if you like Mary Stewart I think you’ll like Victoria Holt. A step up from Victoria Holt, in a manner of speaking, would be the novels of Catherine Gaskin who wrote both historican and contemporary. In a way, I find some of her novels more like those of Mary Stewart … try The File on Devlin or Edge of Glass or even The Tilsit Inheritance for contemporary and, as I’ve said, Blake’s Reach for historical. I think my favourite has to be The Summer of the Spanish Woman. Although published in 1977 and although I no longer have a copy, I can still remember the enjoyment of reading this. Nice to see someone speaking up for Catherine Gaskin, Margaret! I was beginning to think that I was the only person who remembered loving her! I agree with you over the Victoria Holt/Mary Stewart comparisons – I loved them both at different times in my teens but the only resemblance that I can think of is that they had fairly independent-minded heroines! Liz, I couldn’t wait for the books of Catherine Gaskin to be published and I recall rushing out to buy The Summer of the Spanish Woman. However, when we moved house in 1985, I weeded my bookcases and my Gaskins were the ones I let go. wish I had them now. I also enjoyed, although quite different (although the independent-minded heroine was prominent) the espionage books of Evelyn Anthony, another writer popular in the in the 1960s/1970s. I am embarking on weeding my very filled bookshelves again. I wonder who I will “let go” again, and then find, in a few years, that I wish I hadn’t!